White coat hypertension is a real condition that occurs when blood pressure readings at your doctor’s office are higher than they are in other settings, such as your home. The term white coat refers to the traditional white lab coat health care professionals wear in clinical settings. The underlying cause of white coat hypertension is believed to be tension and stress associated with being examined by a physician. Not much attention was given to this condition since the blood pressure of patients returned to normal levels when taken in the home environment, where they feel more relaxed. Recent studies however have proven that people with white coat hypertension are twice as likely to develop true hypertension within a decade, compared to people with normal blood pressure levels. How do you know if you have white coat hypertension and what should you do if you have it? The first step is for your doctor to have you monitor your blood pressure at home to see if it returns to normal levels. If it does, together, you and your doctor can decide whether to treat it or not. On one hand, if your blood pressure is normal during the rest of the day, taking blood pressure medications can lead to hypotension (low blood pressure). On the other hand, people with white coat hypertension might have elevated blood pressure during other stressful parts of the day. Many factors, such as age, family history, and the existence of other conditions will help the doctor make the right decision for you. There are things that you can do to reduce your anxiety and stress before having your blood pressure checked by a health care professional. First, avoid drinking excessive amounts of water before checking your blood pressure because water can increase your reading. Also, do not participate in any physical activity before having your blood pressure taken. Excessive physical exertion will raise blood pressure. Lastly, avoid stressful situations and remain calm leading up to and during your visit to the doctor’s office. 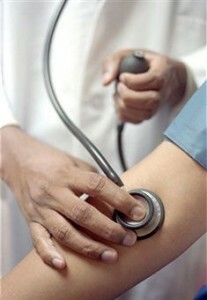 If you think you have hypertension, make an appointment with your doctor immediately. If you do not have a primary care physician, call Flushing Hospital’s Ambulatory Care Center at 718-670-5486 to schedule an appointment. Tap V. Bottled Water: Which is Better? Remember sipping water from a fountain in the park or turning on the kitchen sink for a glass of H2O? Many people today do not have those same experiences because fewer and fewer are drinking tap water. In a recent study, it was revealed that one out of every five U.S. households uses bottled water as their primary or only source of water. Many Americans believe it is a healthier option, but is it really better for you? Tap water and bottled water are regulated by two different agencies. 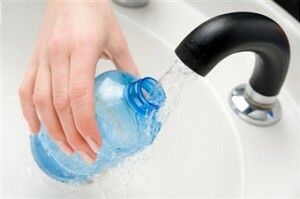 The Environmental Protection Agency oversees tap water and the Food and Drug Administration regulates bottled water. Despite the different governing agencies, the standards of ensuring safety are very similar. Both have strict quality control measures in place to protect the water we drink from harmful bacteria and other contaminates. Another similarity between tap and bottled water is often the source. There are over 500 bottled water plants in the United States and while some of the bottled water originates from sparkling springs, many others come from a municipal water supply. The water is treated, purified and sold to the public at an inflated cost. In fact, bottled water is estimated to cost up to 1,000 times more than tap water. Distinguishing which is healthier is hard to do. The levels of certain important minerals in your water, such as calcium and magnesium, depend on what type of bottled water you purchase or the source of your tap water. Areas that use water sources that contain lower levels of these minerals have a higher rate of heart disease than areas with higher levels. What about taste? Some people prefer the taste of bottled water, citing a funny taste in tap water. The taste that they are referring to is the trace amounts of chlorine used as a disinfectant to guard against the regrowth of microorganisms. Bottled water often utilizes ozone disinfection, which is tasteless and odorless. The last factor to consider when choosing between tap and bottled water is the effect bottled water consumption has on the environment. It is estimated that Americans consume nearly ten billion gallons of bottled water every year. It is also estimated that less than 20% of water bottles are recycled. What do you prefer to drink and why? Flushing Hospital wants to know.